Ever been in a situation where you needed to charge your laptop, the family’s phones, and tablets? The ChargeHub charging station powers up to seven USB devices all at once. The biggest advantage to this is that instead of searching the house for open outlets, you just need one outlet for all of your devices. This is also extremely useful when you are in a hotel room that doesn’t have enough open outlets for all of your devices. The ChargeHub comes with its own handy 3.5” long adapter cables. While you can still use your longer cables, you can also just store them away and use this short cable with no tangling or need to wind them up for storage. The ChargeHub is available in round or square shapes in black, white, green, pink, blue, purple, and red. 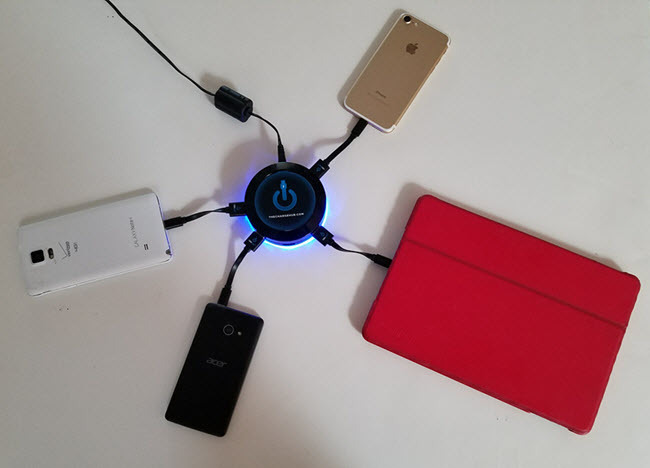 I love bright colors, but I found the round black ChargeHub perfect for blending into the corner table where I keep it when not traveling. 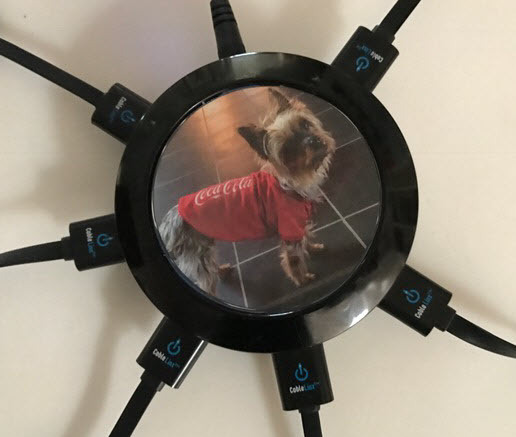 The ChargeHub website also has a design studio where you can easily customize your ChargeHub with a picture and/or text. A small switch on the side lets you turn the soft blue under glow light on and off. It has two levels of brightness and in certain circumstances, like in a hotel room, can be used as a nightlight. When there are no devices connected and the light is turned off, the ChargeHub does not draw any power from the outlet. This is a nice feature when you are using it at home and want to keep it plugged in. Other than adding a picture, if you like, the ChargeHub is ready to use immediately after plugging your device in. The ChargeHub’s power cable is more than 6 feet long so you can place it almost anywhere. It is UL/cUL Listed, FCC Certified, RoHS Compliant, and comes with a 1 Year Limited Warranty. The ChargeHub is capable of providing 8.8 amps total output to your devices. You can charge 7 devices at one time, but you need to remember that larger devices may use more amperage. The typical smartphone uses around 1 amp. The typical tablet uses about 2 amps. So while you could charge 7 smartphones at once, you could only charge 4 tablets at once. I found the ChargeHub to provide speedy charging. The SmartSpeed™ Technology ensures an optimal charge for virtually any USB device, based on the type and number of connected devices. This allows any port to charge the connected device at its maximum charging speed. So you don’t need to worry about what devices or how many devices you attach, the ChargeHub will allocate all the resources properly. If you add too many high amperage devices, the ChargeHub’s blue light will flicker. The biggest drawback to this device is that when a lot of devices are attached, it can take up quite a bit of room. The $59.95 ChargeHub comes with only one micro to USB cable. Other cables can be purchased separately. The $89.95 ChargeHub that I received includes 7 USB Cables (2-Lightning, 2-30-Pin, 2-Micro, 1-Mini to USB) and a useful vehicle charger. For most of us the 30-pin cables are pretty useless. The Super Value Pack on the ChargeHub website seems a bit more updated, it lists 4-Micro and 3-Lightning adapters with the kit. There doesn’t seem to be a USB-C cable available. There is, however, an international travel kit available which includes four of the most common plug types. Whether you simply want to organize your charging routine, you are tired of charging cables that seem to proliferate like rabbits, or you need to charge several devices from one outlet, the ChargeHub is a good solution.